Sometimes you need to extract data from your database and calculate it. Aggregate functions (for example, sums, counts, and averages) enable you to calculate and summarize data in your queries. This article explains what an aggregate function is and shows you how to apply this type of function to your data. ● Finding the sum (total) values in a column. Example: the total amount contributed to a specific fund. ● Obtaining a count of a set of records. Example: the total number of 18-year-old members in an organization. ● Determining the average value in a column. Example: the average dollar amount of pledges made to a specific fund. ● Finding the lowest value in a column. Example: the lowest contribution amount made to a specific fund. ● Finding the highest value in a column. Example: the oldest member in your organization. In each example, all you want is a summary of the column's data—not the column's actual data. Therefore, the query result is always equal to 1. The following table lists and describes the aggregate functions. Position your cursor on top of the column you want to assign the aggregate function to. To remove an aggregate function from a column, drag your cursor to the right of the column until you see this icon, and then click it: . The function is removed from the column name and title to let you know that it is no longer being applied. The most commonly used aggregate function is the Count function. Following is an example of how you might use this function. How many registered families live in the 48108 zip code? For this question, you are looking for a single value: the total number of registered family records. You can obtain the answer by applying the Count aggregate function to the Families > is Registered column. Because you also want to limit the records retrieved to those of registered families in the 48108 zip code are, you need to apply a condition to this column to specify the zip code: Families > Addresses > Home PostalCode. The following procedure shows you how to set up a query to answer the question. In the Column Picker panel, select Families > is registered. Click and drag the is Registered column into the Result Columns panel, making sure that you position the column on the [Add new column] link. Then, release the mouse button. The Count function is now applied to the column. Families. Addresses.Home PostalCode is equal to 48108. To ensure that the query retrieves unique records only, select the Unique Records Only link. The Average function is used to find the average value of a certain column for a selected group of records. The column's value must be numeric for the Average function to work. What is the average amount pledged to the Building Fund Campaign fund? For this question, you are looking for a single numeric value: an average of the dollar amounts in the Pledges > Pledge Total Amount column. The query must add up the values in this column and then calculate the average dollar amount. 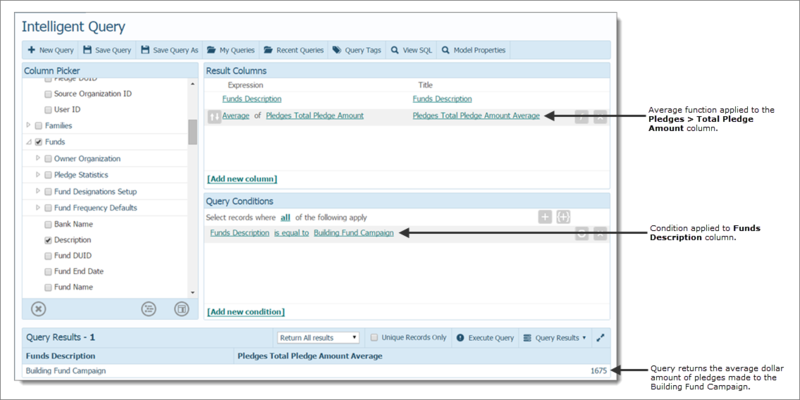 The query also applies a condition to Funds > Description column to retrieve records for the Building Campaign Fund only. The following procedure shows you how to set up the query to answer this question. In the Column Picker panel, select Funds > Description and Pledges > Total Pledge Amount. The Average function is applied to the Pledges Total column. To limit the records to the Building Fund Campaign fund, add this condition: Funds Description is equal to Building Fund Campaign. To retrieve unique records only, select the Unique Records Only link. The Maximum function is used to find the highest value in a certain column for a selected group of records. What is the age of the oldest member in our organization? For this question, you are looking for a single result (age of the oldest member), which you can obtain by applying the Maximum aggregate function to the Members > Age column. In the Column Picker panel, select Members > Age. Click and drag the Age column into the Result Columns panel, making sure that you position the column on the [Add new column] link. Then, release the mouse button. The Maximum function is now applied to the column.